So although I am back to the blogging world, my posts may be slightly short and sweet. Hope that is okay for you all for a while but its all I can deal with. This bag is by far the new love in my life. When I had bought it and was walking to work, the sun was shining, sunglasses on and my huge Ted Baker bag took up most of the walk way around me whilst on my shoulder. But it made me smile, I couldn't stop smiling for the rest of the day at work and my manager was very jealous to hear that I had got it finally! Haha aww thats soo cute! 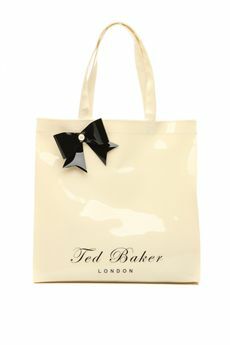 LOVE THE TED BAKER ICON BAG!!! SO ADORABLE!!!!! i may have to buy one, myself! Cute! I am glad your days are looking up! anywayyy what im trying to say is that you should do what you love, and anyway its not exactly nerdy to love fashion! i dont know what you want to do but if you want a career in fashion then your on the right path! please try and stay strong and keep posting. dont include any text if thats your worry, just some nice pics of your outfits will do :) and i cant wait to meet you at the aussie events! whooaaa that was a bit of an essay haha! p.s. i adore that bag and i dont normally go for that kind of stuff, but for £25????? I'm officially in love. It was made from plastics? This glossy material is great. oooh i love it too! so cute. :) your blog is darling! Sounds like a perfect shopping experiance, the bag is so chic! And what a nice boyfriend. That is a NICE bag! love it! Wow! a special tribute?? thanks!!! !